This is so sad! Rest in peace, young man. Your life, and death, gives meaning to the work that so many of your brothers and sisters in blue, grey and brown do each day. It is still such a waste to see a fine young man go down in "the Line." May God bless your soul. May so Rest In Peace. You left us way too soon. God must have plans for you. 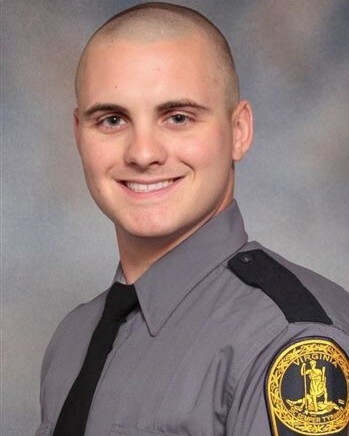 Rest in Peace Trooper Dowell. Thanks you for your service to the citizens of the Commonwealth and I extend my deepest sympathies. Bless you brother, your work is done here! Sir, I would just like to say thank you for your service and sacrifice for the citizens of the state of Virginia. And to your Family and loved ones, I wish to extend my deepest sympathy. May God Bless your soul and i will pray for your family. Words do not seem sufficient to alleviate your sorrow at this time. God has blessed you with many precious and wonderful memories. The best words of comfort have been given to us from heaven: “Let not your heart be troubled: ye believe in God, believe also in me. In my Father’s house are many mansions: if it were not so, I would have told you. I go to prepare a place for you. And if I go and prepare a place for you, I will come again, and receive you unto myself; that where I am, there ye may be also.” (John 14:1-3). With deepest sympathy. To the family of Trooper Lucas Dowell, friends, Colonel Gary T. Settle and the Virginia State Police. You are lifted up in heart, thought and prayers. May God comfort, hold you close, and give you His peace that surpasses all understanding to keep your hearts and minds through Christ Jesus now and always. Thank you for your service. I have lifted your family to God every morning for over seven years. I pray that Lucas' life and death will bring glory to God. Went to your service today and will be back tomorrow. I wished meeting your family was under better times. I wished I could go back and change that day. It was a humbling experience to see Troopers from all over this country as well as officers from NYPD showing support for you and your family and VSP troopers . It was humbling to see so many of your VSP Troopers showing support to your family and to each other. To see the amount of civilians there to show support told me all I needed to know about the man and trooper you were. I am truly sorry. I am always at your families service. They have my number. To the Mother and Father and Sister. I am beyond any words to comfort you. There are simply none to do that. You are forever in my prayers. Trooper Dowell, My respects Sir. RIP, Trooper Lucas Dowell (Brother in Blue) Continue your tour of duty in heaven brother, as you now have Blue Wings. On behalf of the Hillsborough County Sheriff's Office Honor Guard, we send our deepest sympathies and condolences. R.I.P. Trooper Dowell, may God bless you and keep you. May God comfort your family, friends and all our brothers and sisters with the Virginia State Police. May God wrap you in his loving arms and grant your family and friends strength, comfort and peace during this difficult time. We will keep you all in our thoughts and prayers my brother. Please know that you and your service will never be forgotten. Fidelis Ad Mortem my brother as we remain Standing Tall For Those Who Have Fallen. We have the watch from here. For now and evermore. BY:Robert Longly May god comfort your friends and family during this tragic time , rest easy brother we’ll take the watch from here .